Dr Hothi has been our family dentist for over 11 years. He was an excellent dentist for my children, twins, who were 9 years of age at the time. They learnt to take care of their teeth and to this day have excellent oral hygiene habits. 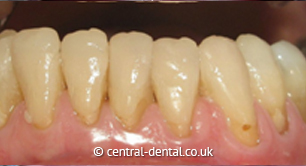 He has always encouraged a conservative approach to dentistry and given us excellent care and advice over the years. My teeth were horribly worn and getting rapidly worse to the extent that I had to avoid certain food and felt self-conscious about smiling too broadly. 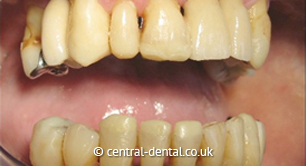 It seemed no amount of conventional dentistry could improve things. 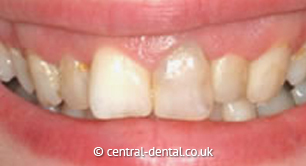 I was referred to Dr Hothi by my dentist and have been delighted with the work done by him. The work took several hours but was painless with no after effects. I can now eat anything I want and smile with confidence. Dr Hothi has proven to be a Dental Surgeon of the highest standard and presents himself in an extremely friendly manner. 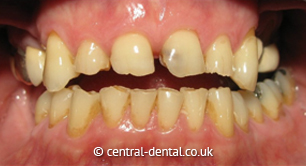 If you have chipped, broken teeth with sharp edges, this is often due to general tooth wear (caused by attrition, acid erosion and abrasion). This is a complex problem which if left untreated, will result in more teeth continuing to break in the future, and some of these may end up needing root canal therapy or even extraction. 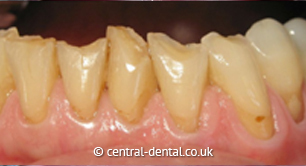 There is a fantastic drill-free, injection-free treatment possible offering a natural looking, long-lasting and predictable solution that will prevent further tooth fractures and protect your teeth. 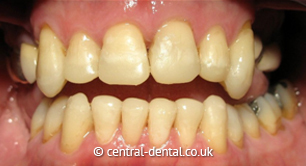 Dr Hothi has a special interest in tooth wear, with a background of over 17 years of experience in helping in such cases. The degree of whiteness achieved will vary from patient to patient and with the type of bleaching process chosen. Home Whitening involves a whitening gel being placed in a custom-made tray which you can wear whilst asleep or for short periods during the day. Results are normally seen over 2 weeks. If your front teeth are stained, chipped, or malaligned, veneers will give you a good life-like cosmetic appearance with minimum tooth adjustment. 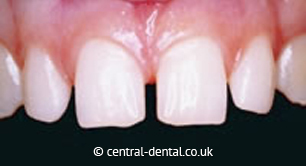 A veneer is a porcelain facing on the front of your teeth usually your top teeth. It is just like a false finger nail. 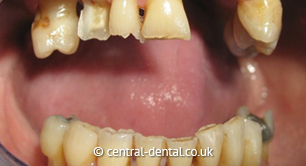 Veneers make teeth look natural and healthy. They are very thin and are held in place by a special strong bond (rather like super-glue) so very little preparation of the tooth is needed. 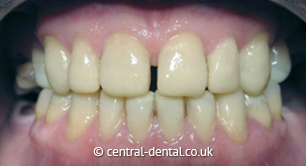 A precise shade of porcelain can be chosen to give the right colour to improve a single discoloured or stained tooth or to generally lighten front teeth (usually the upper ones). 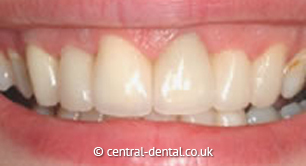 Veneers can also be used to close small gaps when orthodontics (braces) are not suitable. 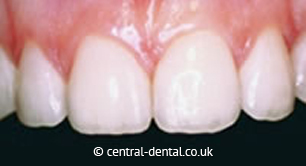 If one tooth is slightly out of position a veneer can sometimes be fitted to bring it into line with the others. Visit Central Dental near Twickenham to find out more about veneer cosmetic dentistry from our expert, Dr Hothi. 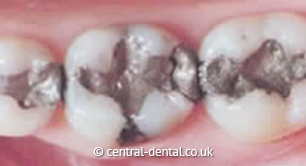 Our dentist can safely replace silver amalgam fillings with white tooth coloured fillings. 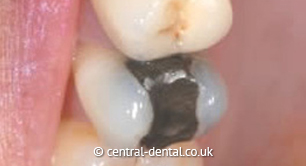 Find out more about decay detection in our Preventative Dentistry section. Sometimes there may not be room in your mouth for your wisdom teeth and as they start to come through, they push against the teeth already there or may start to come through at an angle. When this happens, you might feel some pain or discomfort, so the best thing to do is to visit your dentist. If you feel pain a few days after the tooth has been removed, it might be where the blood clot has broken down leaving an empty hole in the gum. 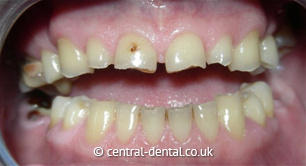 This is called a 'dry socket' and will need to be looked at by your dentist. 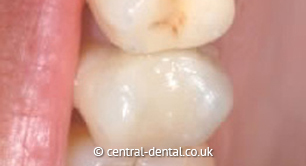 Simply come back to the practice and the dentist will pack the wound to ease your discomfort. 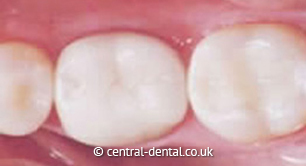 FISSURE sealants (tooth coloured sealants) are applied to biting surfaces of children's teeth to prevent decay. It's not easy... so that's why this web site is here. Giving up smoking requires preparation, determination, and support. This site is here to help you with each of these. If you're thinking about giving up, take a look at this site. We have access to some excellent specialist services, and we will refer you to them for Orthodontic, Implantology, Oral surgery and Periodontal care. At Central Dental we stock a wide range of oral healthcare products at competitive prices for your convenience. Please ask at reception.